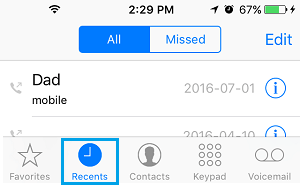 The Call blocking feature on iPhone can be used to block any phone number on iPhone, while the DND mode can be used to block unknown spam callers. 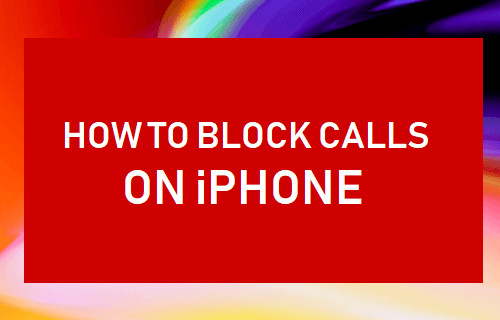 You will find below the steps to Block Calls on iPhone. Most users are looking for a way to Block Calls on iPhone, in order to avoid spam callers and telemarketers. Another fairly common reason for people wanting to Block Calls on iPhone is to prevent someone from annoying them with unwanted Calls. 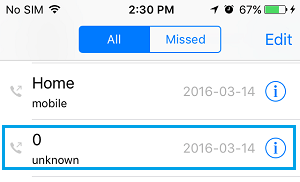 Irrespective of the reason, it is easy to block both known and unknown or spam Calls on iPhone. 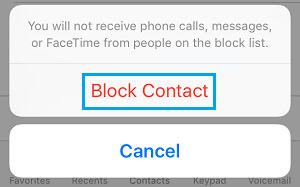 Follow the steps below to block calls on iPhone from a known person who is listed on your Contact List. 2. On the Contacts screen, tap on the Name/Number of the Contact that you want to block. 3. On the next screen, scroll down and tap on Block this Caller. 4. On the pop-up, tap on Block Contact to confirm. Now this particular Contact won’t be able to bother you with unwanted Calls. 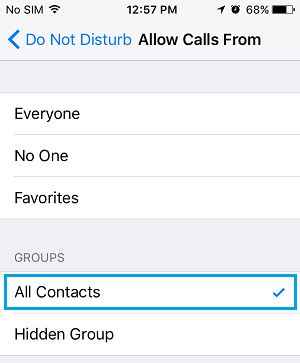 Once the Call Block is removed, this Contact will be able to Call and Text you on your iPhone. Telemarketers mostly use toll free (1-800) numbers and usually keep calling from the same number, hoping for a response from you. Follow the steps below to block Calls on iPhone from a Telemarketer or someone who is not listed on your Contact List. 3. On Recent Calls screen, tap on the “i” icon located next to the Telemarketers Phone Number. 4. On the next screen, scroll down and tap on Block this Caller. Now this particular Phone Number will be added to the block list on your iPhone. Some Telemarketers and spam callers may hide their caller ID, in which case the Phone Number of the Caller will be displayed as Private Number. 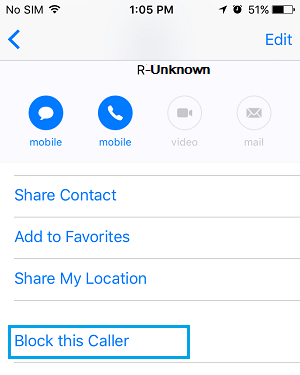 Unfortunately, the Call blocking feature on iPhone gets easily bypassed, if anyone calls your iPhone using Hidden Caller ID or uses some other way to hide his/her Phone number. 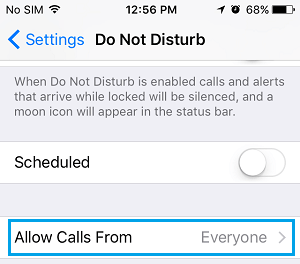 The only way to block Anonymous, Hidden Calls or Private Number Calls on iPhone is to configure the Do Not Disturb Mode on your iPhone to receive Calls only from people listed on your Contact List. 1. 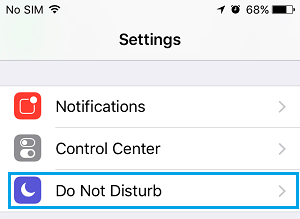 Open Settings and tap on Do Not Disturb. 2. On the Do Not Disturb Screen, tap on Allow Calls From. After this, your iPhone will only allow Calls from people who are listed on your Contact List, all other Calls from Unknown or Private Number callers will be blocked. The good think about this setup is that genuine Callers who are trying to reach you will be able to leave a voicemail and you will also get missed Call Notifications.